One of the really weird things for me is when people want me to sign my book. I feel like the only time my signature is valuable is on a check written from the good account. I do love signing books at a bookstore because they can’t return them to the publisher. That fits into my narrative that my signature actually makes it worth less! Nonetheless, I am honored when people find some value in a personal word or signature. I have gotten many inquiries via Facebook and Twitter about getting signed copies. The logistics and expense of that is a bit daunting. However, I am offering a low cost alternative if you would like a personal note in your book or a book for a friend. 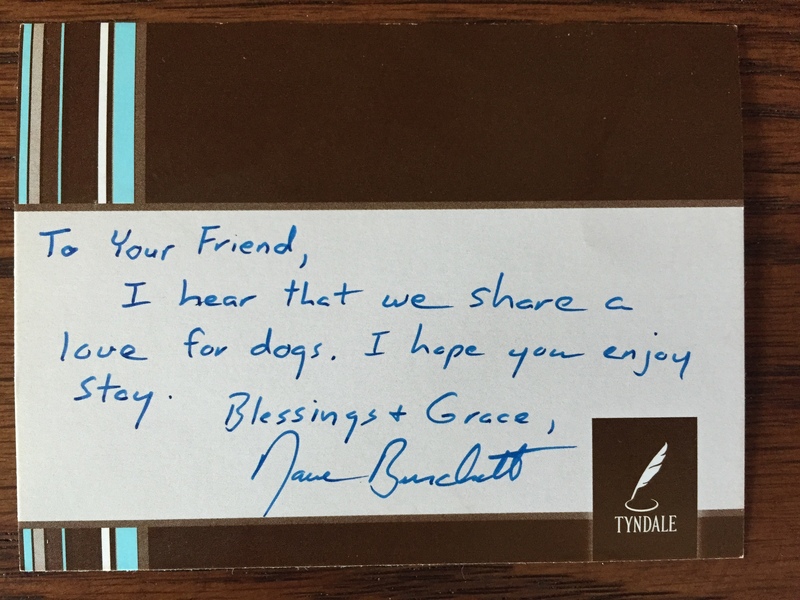 Tyndale House Publishing provides autograph plates that adhere to an inside page of the book. Send me a self-addressed and stamped envelope (#6 envelope works great) inside of a regular business envelope. Clearly print the name you want it signed to and a very brief message. Here is an example of the length of message that fits. I will sign an autograph plate or plates and return them to you. I am excited and grateful that so many of you are giving Stay as gifts to your dog-loving friends and relatives. Here is what the reviewer said at Kara’s Book Korner. If you are a dog lover or know one, hand them this book. And if you know a dog lover who is not a Christian, this could be a great outreach tool to introduce them to Scripture and the Creator of all. Thanks for your encouragement and support. I would also be grateful if you would continue to spread the word that a free preview of Stay is available to read by clicking here. Next ArticleThe Worst Day Ever?